Many clients and are currently asking what to do about the continuing depreciation of the Russian Ruble, and how to secure their wealth. Most importantly, we would like to reassure everyone that the world will not end and this crisis can be an opportunity. Fears concerning an economic downturn, a further weakening of the Ruble and a loss of personal wealth are understandable. Panic is not a good strategy when it comes to protecting wealth and making money. 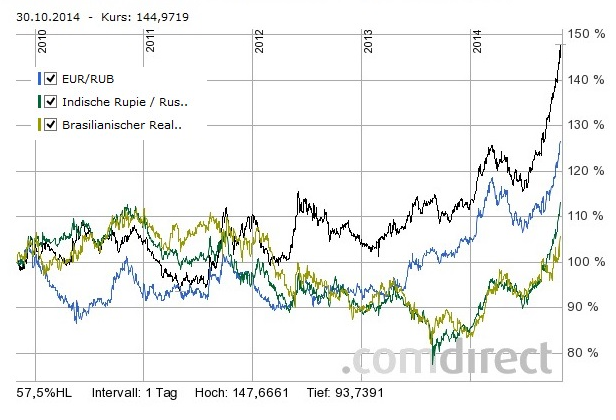 Warren Buffett once said he has always tried to “be fearful when others are greedy, and greedy when others are fearful.” The graph below shows that since the middle of 2013, the Ruble depreciated significantly compared to major currencies like the USD (black line) and the Euro (blue line), but also against other emerging market currencies like the Indian Rupee (green line) and Brazilian Real (golden line). Risks regarding the ruble remain. The Russian economy is highly dependent on commodity exports, especially oil and natural gas. In recent month the price of oil has plummeted while the Ruble depreciated. From a high of US$ 106.99 in the middle of June for West Texas Intermediate (WTI) oil to a low of $US 80.52 on 24th of October, a price drop of -32.9% in 4 months. The price decline of oil and a devaluation of Ruble means Russian companies that export goods paid in US Dollars are not suffering as much by the falling oil price as for example oil producers in the United States and Canadian tar-sand oil producers. Russian agricultural companies should profit from sanctions opposed by Russia against the West as Russian retailer will try to find substitutes for Western products. They will find these substitutes in Russia, but also in other countries like Israel, Turkey, China or Brazil, among others. Sectors most hit by current sanctions are the ones that are dependent on high-tech and engineering products which must be imported. To find substitutes for these types of products companies will need time and (probably) more money. The longer the sanctions will last the more companies will try to avoid sanctions by producing and exporting from origins that are not covered by sanctions. Russia sits on huge natural resources that cannot be moved, knowledge and technology can be moved, only requiring some time. A closer look at the Russian Ruble shows that it depreciated in US Dollars terms by 57.5% from beginning of 2011, priced at 27.33 Ruble per U.S. Dollar. Currently one has to pay around 43 Ruble per U.S. Dollar. The strongest depreciation of the Ruble happened from mid-2104 until end of October 2014. This is a very strong move for the currency market. Usually a correction should take place and technical analysis suggest this correction to lead to 40 Ruble per Dollar. However, current geo-political and economic situation suggests otherwise. 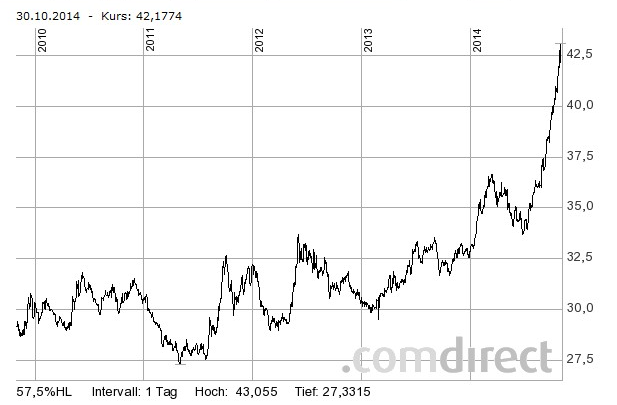 A USD/RUB price of 45-46 is highly likely. In case oil prices remain at current level, or even drop further, the Ruble should weaken further to a level of 50-52Rubles per U.S. Dollar. We see the current situation as dangerous, but not disastrous. Russian companies appear cheap, especially oil and gas exporters. Retail stocks post record revenues, suggesting that Russians are still consuming. Agricultural companies should profit, as well as some technology and banking corporations, as a possible longer-term move away from the US Dollar will create new opportunities. To get through the current troubles a diversified portfolio is essential, and we prefer to hold assets denominated in US Dollars in the present climate. 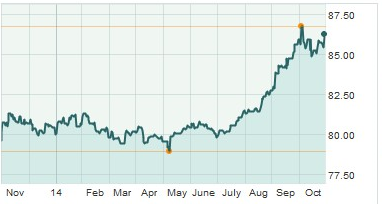 Currently, an investor would be well advised to take part in the strengthening US Dollar trend. The forward guidance of the Federal Reserve accompanied by a stronger US economy point to a strengthening US Dollar. Over recent month the US Dollar was the main profiteer. The chart below shows the Dollar index, which compares the US Dollar to a basket of major currencies. One can see that the Dollar strengthened significantly over the recent month. 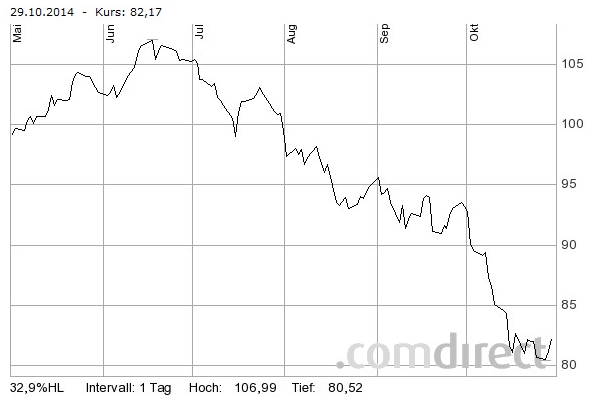 Expected US interest rate hike makes the US Dollar preferable over the Euro, where interest rates will stay close to zero for longer. Some European banks have even imposed negative interest rate on deposits already. Russian shares appear even cheaper and for clients willing to take some risk we have a selection of Russian equities which offer good opportunities for capital growth over the longer term, plus high dividend yields in the short term. For Russian investors afraid of converting their Rubles to US Dollars at the current rates, we would recommend to do it now before rates become increasingly worse. To offset the low Ruble exchange rate, we suggest investing some of the new money in foreign-listings of Russian equities. A possible future appreciation of the Ruble would be reflected in the share price, plus the investor would receive the dividend. There are also good opportunities in the corporate bond market for Dollar denominated assets with a current yield of around 7%. 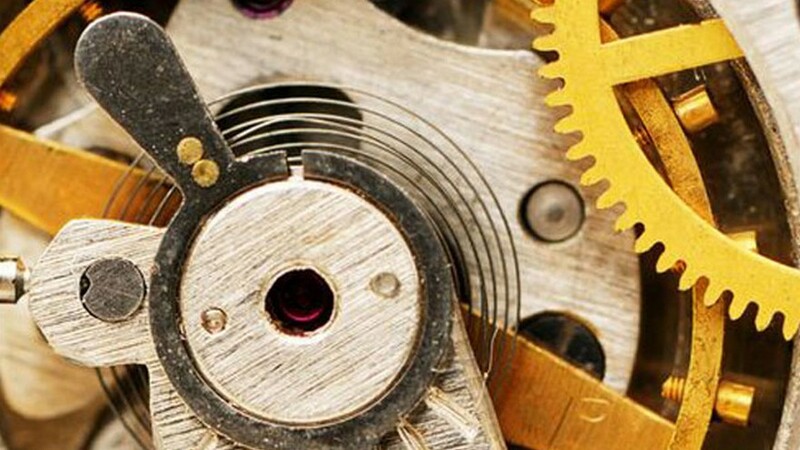 A mix of US corporate bonds and Russian equities could be a good diversification and would reduce worries about future geo-political tensions and economic developments. DISCLAIMER: Comments/charts do not necessarily imply their suitability for individual portfolios or situations in respect of which further advice should be sought. Shoreline is not responsible for the content of external internet sites. This information used in this newsletter has been prepared from a wide variety of sources that Shoreline, to the best of its knowledge and belief, considers accurate. You should make your own enquiries about the investments and we strongly suggest you seek advice before acting upon any recommendation. The opinions expressed in this report are those held by the authors at the time of going to print. The views expressed herein are not to be taken as advice or recommendation to sell or buy shares. This material should not be relied on as including sufficient information to support an investment decision. Any forecasts or opinions expressed are Shoreline’s own at the date of this document and may be subject to change.